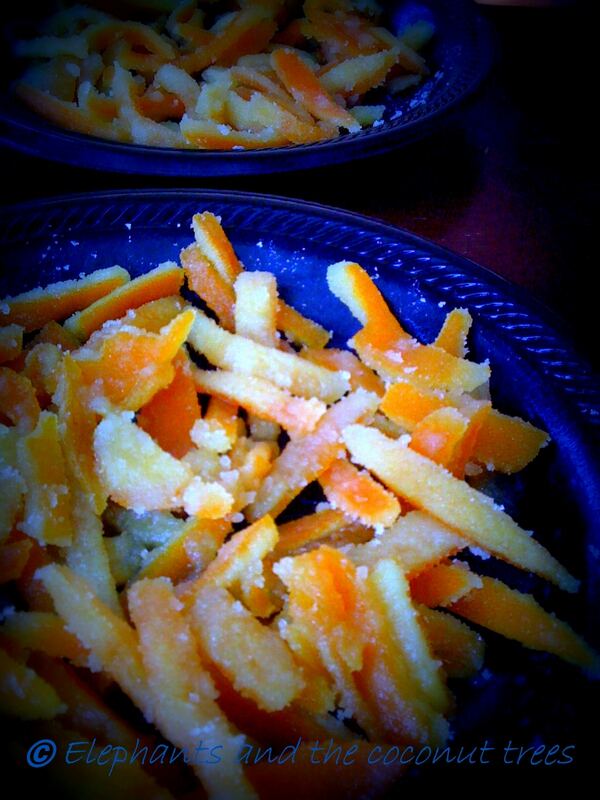 Orange peels meet with a happy ending even though they start off bitter tasting. Every time i think of oranges this short story comes to my mind. “Seventeen Oranges”written by Bill Naughton .In the story a small boy is caught red handed for stealing oranges .He is locked up in a room with the seventeen oranges.Now the boy decides to erase the evidence or he would lose his job so he ate all the oranges ,peels and seeds.He escaped from going to prison but he was sick for a whole week.I just can’t imagine how the boy ate ”17 whole oranges”in one sitting even if it is a story. Let me take u to the other side of the story .Bitter tasting orange peels in a cooked candied form are so yummy I can assure u that.Also you don’t have to finish in one sitting like the poor boy did,candied orange rinds have long shelf life if dried well. I do peel oranges for breakfast for my family .I somehow don’t like throwing away the peel until I finish my cooking and leave the kitchen.I started hunting for ways to keep the aroma lingering around me for longer. 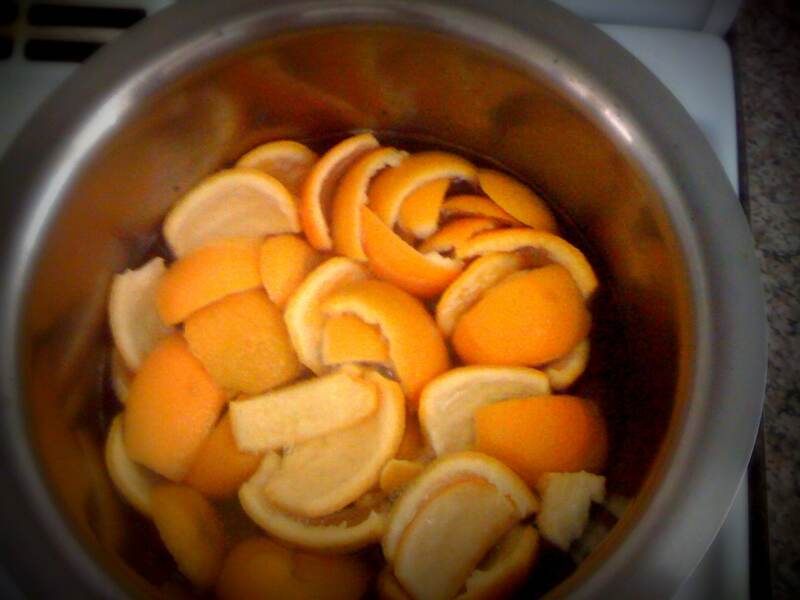 Then one day I stumbled upon a video about candied orange peels.Little did I know what was in store for me.I decided to go ahead with the candying.I started to cook the peels and trust me when I say I was in such joy for the next few hours.Every breath was orange infused. Let me tell you it is time consuming but i enjoyed every bit of it.My idea was, anyway i am making it so let me make some and store. I made a whole box of it but you can make as little as u want. 1.Take a heavy bottom pot fill it with enough water to cover the peels and boil for 10 minutes .Strain off the water and refill fresh water .Repeat the boiling process two more times until u don’t taste the harsh bitterness.Drain off all the water and let it cool on a flat surface . 2.With a spoon scoop off the white pith .You can srape off as little as u want or if u are bend upon erasing last bit of bitterness then go ahead and scrape off till u see the orange color.Cut it into 1/4” long stripes. 3.Boil 1 cup water in another pan add sugar let it boil add peels and reduce the flame to lowest. Let it simmer for an hour.Stir every now and then .Keep an eye on it. 4. Take the orange rind out and let it cool and dry on a flat surface without touching each other . 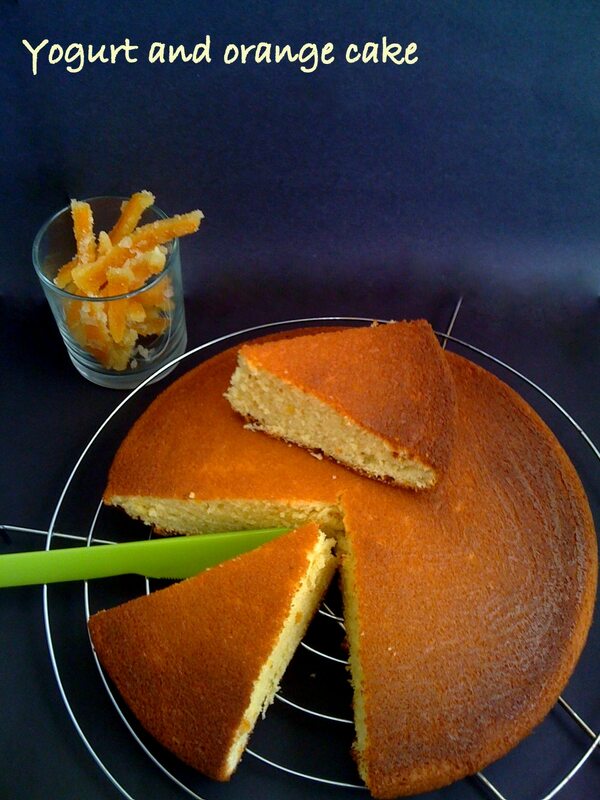 The sugar left in the pan can be stored in fridge as orange flavoring. 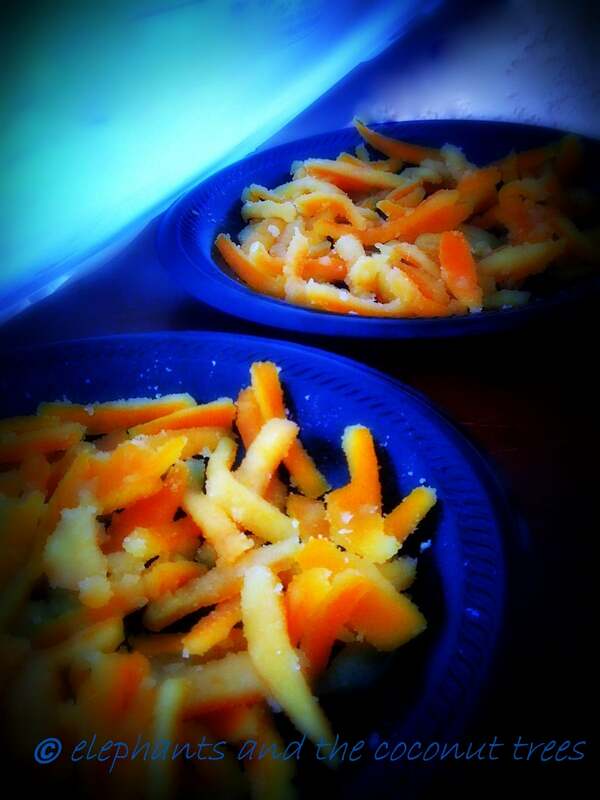 5.Once the rinds are completely dry store them in an airtight container. 2.Melt chocolate , dip in it let it dry completely then eat it like a candy. 3.They can be used to decorate ice cream or other citrus desserts. Hope u liked it .